MAGNE-100 Sport is a high quality complex of four forms of magnesium and vit. B6, which aids its absorption. Magnesium is necessary, among others, for the proper functioning of the circulatory and the nervous system and also in the processes of energy production and muscle contraction. Its deficiency can lead to states of overtiredness, general irritation and overtraining. MAGNE-100 Sport covers the daily magnesium demand, especially in the case of sportsmen, who are prone to significant magnesium deficiencies, as well as physically and professionally active persons. Tired and low on energy? Rather than being fun, exercise is becoming a chore? You’re also irritable and anxious, or perhaps you’re troubled by unpleasant muscle cramps? You’re most likely lacking magnesium! Do you realise how important this mineral is for your body? Do you know that your body cannot function properly without the right amount of magnesium? This element plays a part in close to 300 metabolic processes, therefore even a small deficit may cause a generally weakened mental and physical ability. As our food is highly processed it often lacks key minerals. That’s why you should reach for the high quality formula of MAGNE-100 to prevent magnesium deficiency. The product includes a complex of four easily absorbable forms of magnesium, supplemented with vitamin B6, which improves the effectiveness of magnesium absorption. 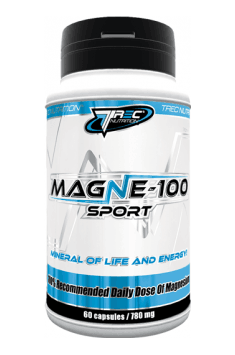 MAGNE-100 Sport includes 100% of the body’s daily magnesium requirement. Each daily dose of the formula (2 capsules) provides as much as 375 mg of pure magnesium in a highly bioavailable form. AN ELEMENT OF LIFE AND ENERGY! Magnesium plays such an important role in the human body that scientists call it the mineral of life and energy - with good reason. Magnesium has the greatest effect on the metabolism of all minerals. It is responsible for millions of processes occurring in every cell of the human body. Almost half of all magnesium in the human body is stored in the bones, while the majority of the remainder can be found in various cells and organs throughout the body. Just 1% of the mineral circulates in the bloodstream. Magnesium is essential for the correct functioning of the immune, circulatory and nervous systems. From the perspective of exercise physiology, it plays a crucial role in the generation of energy, transport of electrolytes, maintaining the correct glucose levels, transmitting nerve impulses, synthesis of muscle proteins, and the mineralisation of the skeletal system. Since maintaining optimal levels of magnesium in the body is extremely important, everyone - regardless of their level of daily physical activity - should take care to obtain the appropriate levels of this mineral in their everyday diet. No mineral is as important for athletes as magnesium! Unfortunately some people think of it as just a treatment for muscle cramps. It’s true that they are an unpleasant effect of a magnesium deficiency, manifested among others by the disruption of the correct function of muscle fibres. However, the mineral shouldn’t be thought of just as an immediate antidote, since muscle cramps are just one of the noticeable effects of its deficit. It can easily go unnoticed, and worsen day after day. Intensive bouts of exercise and a poorly balanced diet further increase the escape of magnesium from the body, leading to a dramatic loss of efficiency. The mineral is one of the most important components of energy required during exercise. If you don’t consume the right amount of magnesium every day, no other supplement will help you. Magnesium is a fundamental mineral component in muscle contractions, essential in the process of energy generation. Its active participation in the production and hydrolysis of ATP (adenosine triphosphate) provides the right amount of energy for intensively working muscles, regardless of the type of work they do. Even the slightest magnesium deficiency decreases the efficiency of ATP conversion in cells, resulting in symptoms of premature fatigue, which with time may turn into potentially dangerous overtraining. During physical effort, the body’s energy demand increases dramatically, while metabolic processes are rapidly accelerated to ensure continuous and efficient muscle power. The intensity of ATP conversion during aerobic exercise and metabolism increases 20-fold, while during strenuous power training (using anaerobic metabolism) it may increase by as much as 50-fold! This results in a dynamic increase of magnesium use in metabolic processes. At the same time the excretion of the mineral in sweat and urine increases by up to 30%. The net result is that the demand for magnesium may be as much as 20% higher in people who exercise regularly. WHO SHOULD TAKE THE FORMULA? MAGNE-100 Sport is a highest quality, easily absorbable mineral complex recommended for everyday supplementation of magnesium in the diet. Its use is especially recommended to people at risk of a deficiency of the mineral linked with high levels of physical activity, manifested through a generally weakened mental and physical ability or chronic fatigue. Take a single serving - 1 capsule 2 times a day preferably during a meal. Wash down with approx. 300 ml of water. The recommended daily dose for magnesium is 200-400 mg (1-2 capsules a day). It is best to take the preparation during or a moment after a meal. Using the supplement in excessive amounts may have a laxative effects. In such a case, the dose and frequency of application should be reduced. Trec Nutrition is a company offering a wide choice of products for athletes. Products of this brand include carbohydrate-protein supplements, protein and energizers. The offer also includes amino acid supplements, creatine, HMB, fat burners, thermogenics, products supporting metabolism and speeding up the regeneration of joints. Capsule shell (Gelatin, Coloring agent (Titanium oxide), Anti-caking agent (Magnesium salts of fatty acids). Ashwagandha root extract in liquid form. Increases resistance to stress and helps improve mood. Balanced formula optimising liver function; supports the body’s detoxification processes. Plant-based preparation with a laxative effect. Support the proper functioning of the digestive system. Supplement that accelerates the regeneration, stimulates the production of growth hormone and reduction of body fat. High-quality CBD oil. Anti-inflammatory, analgesic, and regeneration-enhancing properties. Relatonic Forte protects the nervous system and supports the brain and adrenal functions. Magnesium oxide – the most common form of this macroelement in supplementation that is essential to the human body. It belongs to a group of key intracellular cations and that is why its adequate levels are critical to maintaining the body’s homeostasis. An active lifestyle increases requirements for magnesium and that is why its supplementation is recommended strongly to athletes. The most common symptoms associated with magnesium deficiencies are muscle cramps and eye twitches. This is connected with a significant impact of magnesium ions on the efficiency of the nervous system. Its adequate intake helps maintain neuromotor fitness. Deficiencies of this element are also said to aggravate symptoms of depression. What is more, magnesium supplementation supports healthy cardiovascular function. It is suggested that its deficiencies promote the development of atherosclerotic lesions and hypertension. Too low dietary magnesium intake is associated with arrythmia and increased risk of heart attack. Magnesium supplements are recommended to individuals doing hard mental work and learning. Its healthy levels enhance focus and may facilitate learning. It has a beneficial impact on sleep quality. Magnesium citrate is a salt of magnesium and citric acid. It constitutes one of the best assimilable forms of magnesium, which plays many important functions in the organism. It is responsible, among others, for the proper work of the nervous, immune and muscle systems. Magnesium has calming effect by decreasing the excitability of nerve cells. Thanks to introducing this element to a diet, we may potentially improve sleep quality and reduce the level of stress. Positive influence on the circulatory system is another feature of magnesium. It prevents hypertension and storage of cholesterol in the walls of blood vessels (arteries), thanks to which it may prevent diseases related to the circulatory system. Magnesium also plays a considerable role in the process of muscle contraction, therefore it influences the activity of the whole muscle system. It also takes part in the proper synthesis of protein, the process of cell division and proper course of energy metabolism. It helps to maintain healthy teeth and bones and general electrolyte balance in the organism.